Luke Thompson is the co-founder and lead programmer of Sigtrap Games, an indie game studio based in Manchester, UK. Their first game, a roguelite called Sublevel Zero, is really rather good. Yes, the headline is a bit clickbait; no, I’m not sorry. Hear me out. Indie games, practically speaking, are defined largely by their constraints. Indie studios don’t have access to virtually unlimited budgets. They don’t have teams numbering in the hundreds. Generally they don’t have first-party support, time, or in many cases even offices. I speak from experience on all of the above. These constraints close lots of game design doors. 50 hour campaign? Unlikely. Stealth, vehicles, crafting, RPG elements, multiplayer? Pick two, maybe. Mo-cap cinematics voiced by name actors? Look, I’m labouring this now; I’m sure you get it. So what makes good indie game design? Identifying the one or two things you can do, and doing them well. Passion and laser-focus are the indie dev’s answer to seven-figure stacks and team sizes with one or more zeroes at the end. This is why some of the most exciting game design over the last few years has come out of tiny studios. Without money to brute-force development, small teams have to make tight, innovative games that rely on quality over quantity. Games like Superhot, Devil Daggers, or Papers, Please take one or two core ideas and put all their other game design tools to work in support of polishing them. All decisions must be made to further the core loop, the core experience of the game. No fluff. Good indie games differ in their central mechanic—The Stanley Parable’s meta-narrative, Titan Souls’ one-hit bosses—but they don’t vary in their fixation on it. So far, so preamble. 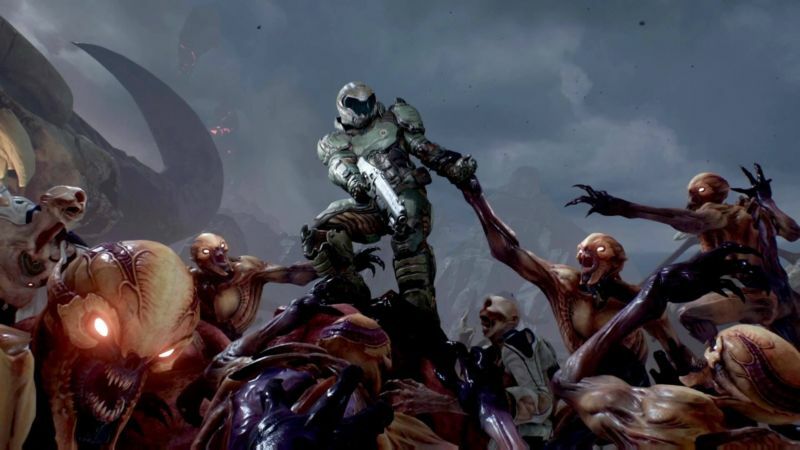 To get to the point, then: Doom 2016 is, at its heart, an indie game. Not on the surface. Not in the trappings. Not in the budget or the length or the team size, but in that fixation. It didn’t need to be; it wasn’t forced down the usual route of constraints and hard truths. Remember the chorus of “THAT’S NOT DOOM” (an inevitable accompaniment to anything Doom-related) that erupted when its signature Glory Kills system was first revealed? Sure, in the obvious (and ultimately insignificant) sense, it’s not Doom because it wasn’t in the original Doom. But look deeper, and something else becomes apparent. The Glory Kill is exactly Doom—because it achieves the same core goals as the original. Doom’s single player mode does what so few AAA games and even fewer reboots do. They copy the surface details, the skin-deep beauty of the games on which they are based, but miss the point. The point of Doom isn’t demons. The point of Doom isn’t the BFG. It's not even the beloved Super Shotgun. The point is how those elements act in concert to make you act, move, and feel. Combat in Doom was a dance, a puzzle solved with positioning, timing, and judicious application of plasma to face. Without understanding and following that core goal, all the BFGs and Super Shotguns in Hell won't recreate the experience. Doom 2016 holds the same ideals sacred as its forebear, but packs a different toolbox. Everything it does aims—and usually succeeds—at driving that experience forward. Quite literally: Glory Kills keep you moving from one enemy to the next, chaining your eviscerations together, providing combat, traversal, and health mechanics all in one. It’s a 2016 design answer to a 1993 design question. id Software threw out the implementation details and built from the ground up. Frequently this does result in similar solutions; the shotgun bears a striking mechanical resemblance to the original. But other times it does things that, on the surface, look entirely un-Doom. Glory Kills. Weapon upgrades. Nonsensical-but-great ammo-vomiting chainsaw. Is Doom just Hotline Miami but with a bigger budget? 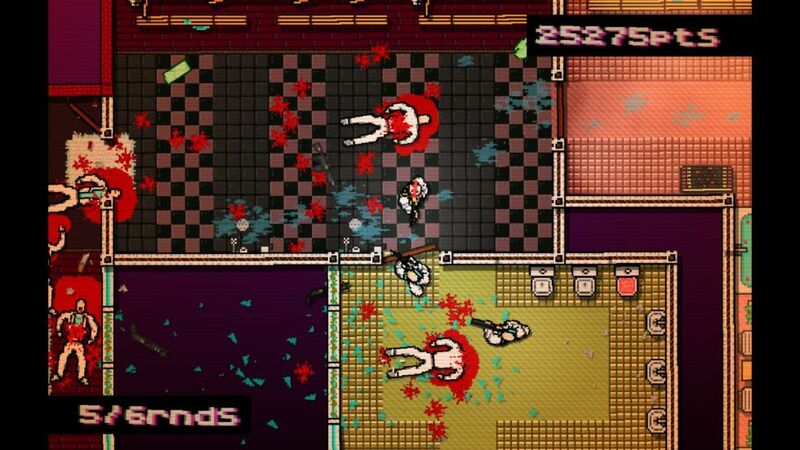 If there’s one other game Doom resembles mechanically it’s Hotline Miami. It shares the same glorious half-planned, half-spontaneous waltz of chained kills and movement. More importantly, though, they share a pointed disdain for anything superfluous. Imagine either with, say, an open world (or any other AAA mainstay). It’d just get between you and killing demons or splattering gangsters—so it’s not there. The only difference is that id Software had the cash to put such elements in, and chose not to. Not all indie games are good, of course, but the ones that are succeed because they don’t spread their ideas thinly. Doom succeeds for the same reason: it opts for one great idea rather than a checklist of passable ones. Compare this to Doom multiplayer, which makes many “modern” concessions, and as a result is unfocused and mediocre. And id clearly know why their game works. The proof is the newly released Arcade mode, which further strips anything that doesn't directly support the core loop. The flow of combat is made even more explicit; to hit the score targets, you have to know exactly how to chain your kills together. Planning, executing, and optimising your dance becomes an addiction, a compulsion to nail those exact movements, precisely timed weapon switches, and left-to-the-last-possible-second powerups. You ride the edge constantly, taking huge but calculated risks which will either make you start again, or get you the “Slayer” rating you crave. And when you get it, after a dozen attempts at the same section, you feel like you’ve truly mastered the game. It’s a feeling reminiscent of beating roguelikes, punishing shmups, or platformers which at first glance look literally impossible. All indie stalwarts, I would add. The new Doom shows us something both amazing and terrifying; it shows us what can be achieved with passion, focus, and a huge pile of cash. This is what AAA games can be if they want to be. That’s a pretty scary prospect for people like me. If the AAA industry decides to do things the indie way, are we out of business? Indies like to rant about the harm that risk-averse, kitchen-sink game design does to our medium, but what happens if the big players agree and start doing our jobs better than us? That’s a genuine question, by the way. I honestly don’t know. But in the meantime, I love Doom. I’m hugely glad it exists, and it’s thrilling to see what such an uncompromising vision can achieve when taken to the logical extremes allowed by the sheer scale of AAA development. It feels strange to say that such an enormous, hyped game from arguably the best-known franchise in games is this year’s surprise hit, but there we are. Because it is surprising, and that’s so rare for that sector. Maybe it’s a fluke, maybe it’s a flash in the pan, or maybe it’ll stick and make indie studios redundant. I’ll just have to wait and see.